I missed the market last week, but after I picked my younger daughter up from school, we headed out to shop. Our first stop was for pork spring rolls from J’s Kitchen. Since we were there a little later to the market this week, she didn’t have enough for a full order (12 pieces), so she substituted in pork wontons, which I hadn’t tried before. They were great, along with the spring rolls. We also had 2 bottles of water, making our total here $6. While we were waiting for our food, we stopped and got kettle corn from Tata Ruben’s Kettle Corn. He gave us a sample first, which convinced me to get the big bag over the little bag (which was $3). The big bag was $6. Next, we headed into the vendors. First stop was Gabe the Bread Man. He greeted us with a smile on his face, happy to tell us how much joy baking brings him. I think that’s his secret ingredient to his delicious bread; he bakes it with joy in his heart. This week, I got one of his new breads to try, Butter Top Italian bread. You can see I tried some before taking this picture. It’s delicious, fluffy, moist, and a nice buttery taste without having to add any extra butter spread. I will enjoy eating this a lot. His loaves are $6 each. Next, I picked up a 3 lb bag of organic jonalicious apples from English Apple Orchard/Arizona Apple Cider. They always have free samples to try the variety before you buy, and this is the one we picked today. This was $5. We stopped next at the Elfrida Community Garden stand. I got 1 pound of lemon cucumbers, something I haven’t had in a while. I had one as a snack tonight, and it was perfect. It was $1.50 for the pound. Then, we stopped for truffles at The Sanctuary stand. We picked Mocha flavor, and got 2, one for me, one for my daughter. They were $1 each, so $2 for both. The next stop was something I had wanted to try for a while, so we stopped to try SAS-Z Nuts pistachios. I tried the salted and roasted variety, and decided to buy the 1 pound bag for $10. He has other sizes available as well. 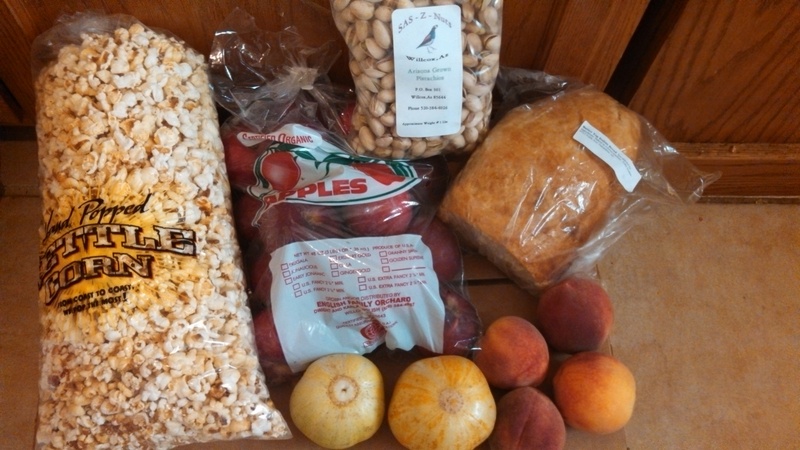 Finally, I got 1 pound of organic peaches from Grammy’s stand that were from Briggs & Eggers orchard. I haven’t tried them yet, but I’m sure they will be great like the ones in my FarmBox. It was a hot one today, so we headed home after we’d made our round. I have some ideas of what to try the next time we make it. 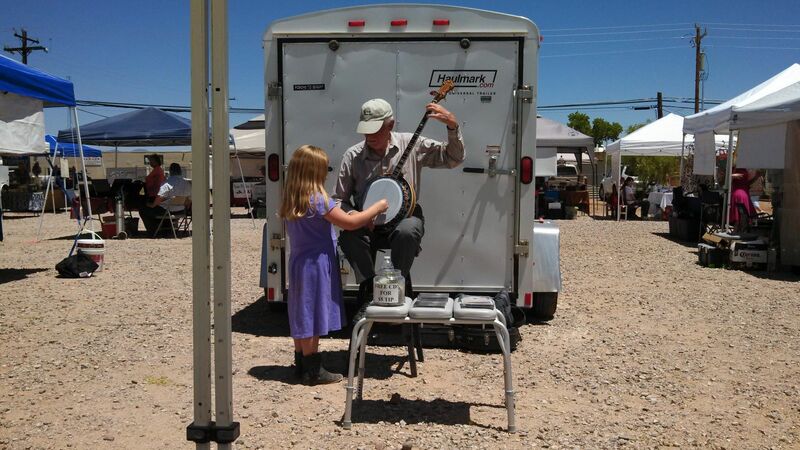 The Sierra Vista Farmer’s Market is held every Thursday from 10am – 2pm at Veteran’s Memorial Park. To learn more, you can visit their website here or their Facebook page. Every week they publish a newsletter with upcoming events and vendors they are expecting at the market that week. Leeks, lots of leeks again…my husband came along this week too, and he wanted more leeks for Potato Leek Soup. It’s actually not too hard to make and I really like it too, so that makes meal planning easy for this week! All those leeks he got for $2.50. Asiago Bread from Gabe the Bread Man. Haven’t gotten his bread in a while, but it’s so fresh and delicious, and no preservatives. It was hard to pick just one, but I chose the Asiago this week, and hopefully will get to try another one next week. Really nice guy too, he donates a lot of bread to local food banks as well. 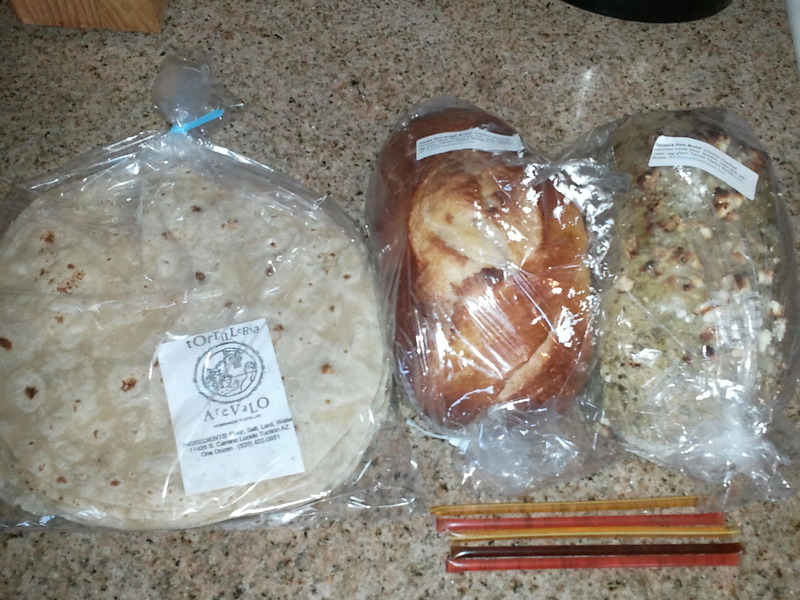 He has quite a variety of breads, now including a gluten-free sandwich bread. I haven’t tried it yet though. This loaf of bread as $6. Blueberry and Chocolate Mochi Cakes from Hana’s Japanese Bakery. We had gotten her cookies previously, and they were really good, so we got her mochi cakes to try today. These are gluten-free. I tried a small piece of the chocolate one, it was really moist and tasty. These were $3, so $6 total. 3 lb bag of organic apples from English Apple Orchard. I can’t remember the variety and the bag isn’t marked, but they are good! This bag was $5. 5 honey sticks, various flavors from Simmons Honey Ranchito. Great deal at only $1 for all 5! Lunch was at J’s Kitchen food truck. What is in the box is the only leftovers. We got 2 of her Veggie Spring Roll meals, which includes 6 spring rolls and a side of fried rice. Delicious! We also got 2 16 oz bottles for water, and paid $11. After lunch, we stopped at Big Woody’s food truck to get shaved ice (no picture). Katie got the pink cotton candy flavor, Sophia got the blue bubble gum flavor. Great treat for a hot day! The small is plenty big and $2.50 each, so it was $5 for both. My husband got his lunch here today, he had their Big Woody’s Cuban, which he loved. All beef hot dog with ham, pork, Swiss cheese, mustard, and pickle on a Cuban roll. I don’t remember how much it cost, but he says it’s well worth the money! Our Farmer’s Market has changed venues! Last week was the first week, but I was travelling home that day and didn’t get home in time for the market. However, I was able to make it this week. Wow! There were so many vendors and people, it was great to see so much support for the market! It was a little overwhelming to take it all in, but I managed to narrow it down to a few good finds and then we headed out. 3 lb bag of organic Jonamac apples from English Family Orchard in Willcox, $5. They are small, but the perfect snack size for my girls since they take about 5 bites out of the big apples and stop. 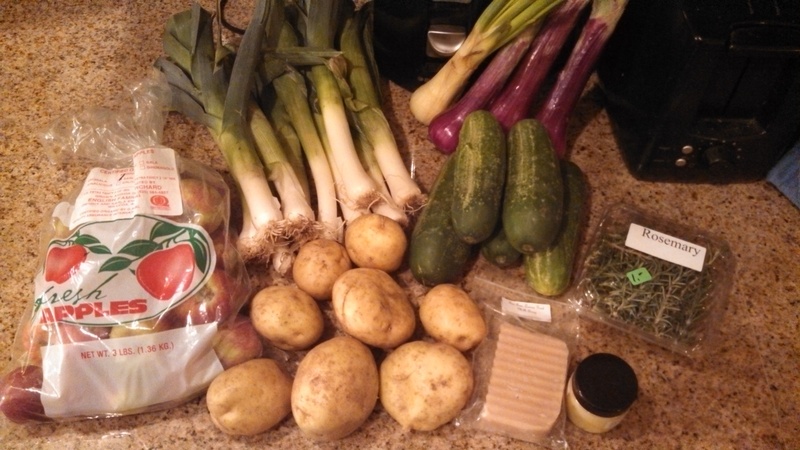 2 lbs of leeks and 2 pounds of potatoes from Beatty’s Apple Orchard, $6 total. I started at only 1 pound, but Dale has been begging for Potato Leek Soup, so we got 2 lbs. It’s not enough potatoes, but I’ll get more when I head to the grocery store soon. 2 lbs cucumbers, 4 onions, 2 dozen eggs (not pictured), Tea Tree Lemon scented goat milk soap, and Tea Tree Lemon scented lotion from Basic Farm 7, $19. I should be set on eggs for a while! The cucumbers I’ll be making into pickles. Fresh rosemary, $1. I can’t remember which stand I got it at, but am all out of rosemary, so I’m glad I found it! Excited to go again next week and see what all I can find! We had a lot of fun at Farmer’s Market today! Next, we stopped at the Hana’s Japanese Bakery table. She has a variety of baked items and this week had fresh Japanese green tea leaves. We chose a bag of black sesame cookies and a bag of lemon cookies. The cookies are $3 each, or $5 when you buy 2, so that’s why we bought 2 to pay $5. Next, we headed to the Sanctuary Farms table. 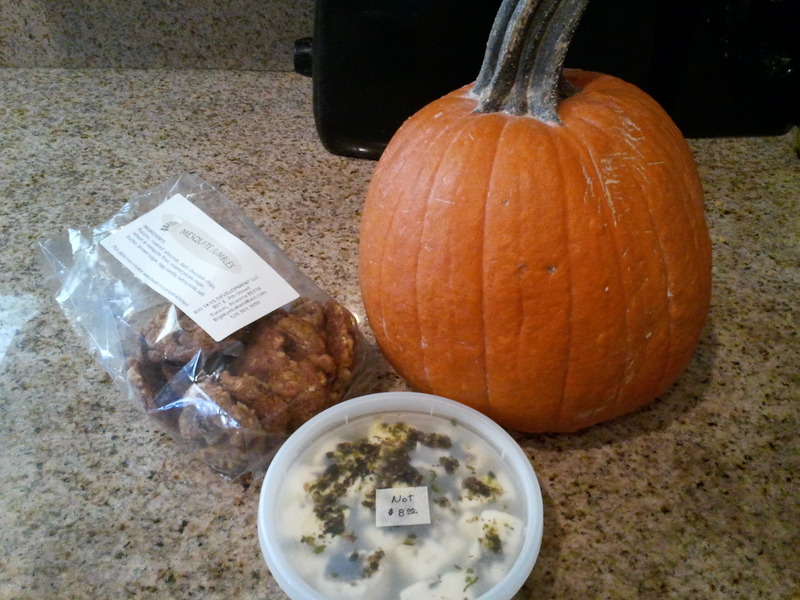 She gave us some samples of her chevre and truffles. Both are very good! We bought 4 oz of chevre with garlic and chives for $4. Next week, I think we’ll be buying some of her truffles, yum! The girls were hungry, so we headed to a new food truck to the Farmer’s Market, J’s Kitchen. I have heard a lot of good things about her food, so we finally tried it today. She had samples of mango and avocado salad and banana and brown sugar spring rolls. Both were delicious! We got an order of chicken rice noodles and 6 pork spring rolls, plus 2 bottles of water, all for $8.50. 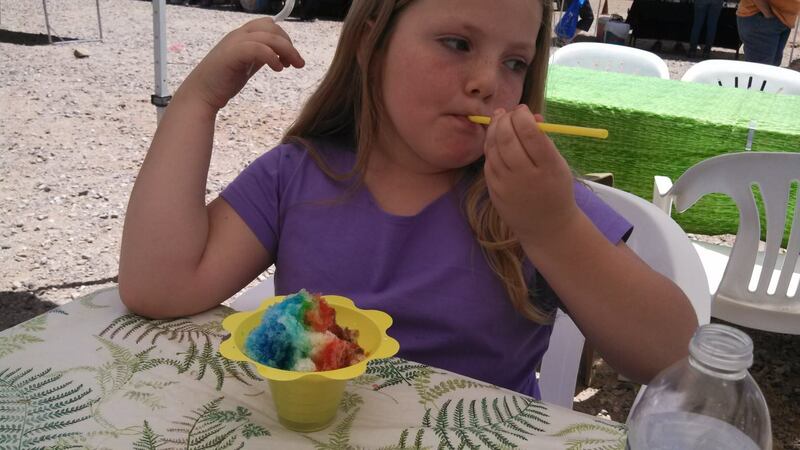 After we sat to eat, I got Hawaiian shaved ice from the Big Woody’s food truck. We got the small size, which were $2.50 each. 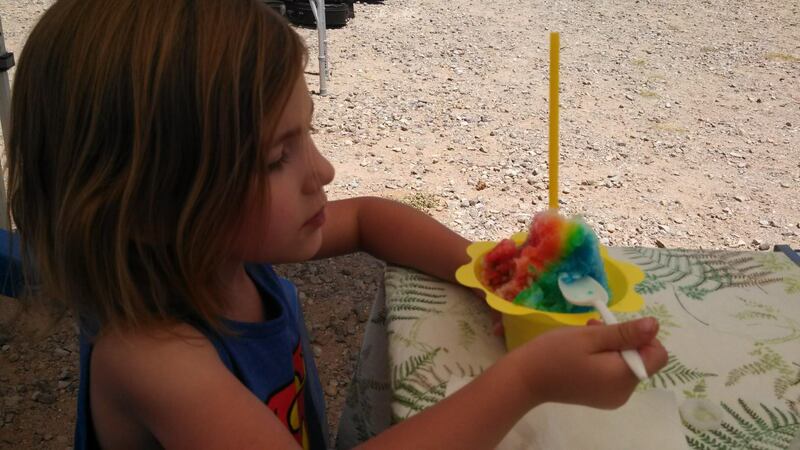 The girls wanted a rainbow of flavors, and it was really tasty and a nice cool treat on a hot day. 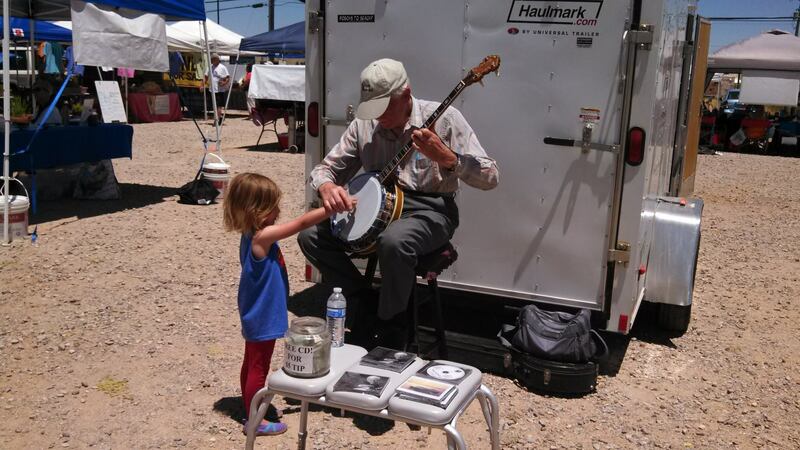 While we ate, we listened to banjo music by Don Van Palta. He let both girls come up and play a song with him. Finally, we picked up a quart size bag of fresh blackberries from Bob Dirks, who was at the Information booth. They were $8, and are delicious! So, here is a picture of all the goodies from today. 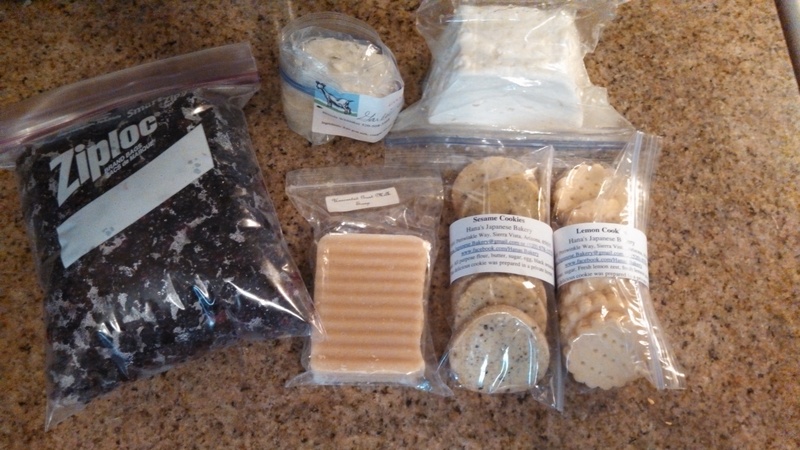 Quart size bag of blackberries, garlic and chive chevre, feta cheese, soap with goat’s milk, black sesame cookies, and lemon cookies. Looking forward to having fun again next week, and seeing what other goodies we can find! I haven’t made it to the Farmer’s Market in a long time! It does run year round here, but I just haven’t found the time to make it. Today, I finally made it back and also picked up some things from a friend’s farm as well. She is going to be at the Community Market on Saturday, but I’m not able to make it then, so I met her today. So, I’ll start with the items from Christie, from Basicfarm7. 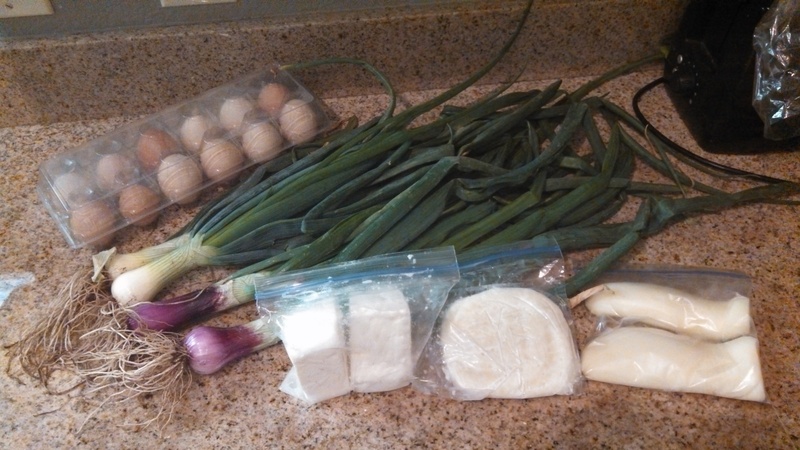 I got 1 dozen fresh eggs, onions, feta cheese, and mozzarella. I had almost half the feta crumbled on a salad for lunch (I LOVE feta!). I chopped up a red onion and some of the greens to add to my stuffed shells filling that we had for dinner tonight. I also grated one bag of the mozzarella for the filling and over the top of the stuffed shells as well. The rest of the mozzarella, another onion, and an egg will go into making a Sausage & Potato Pie. So excited as it’s been a while since I made it. Then, later in the day, I headed to the Farmer’s Market. Not much, but it was nice to walk around and see what was available. The maple syrup is pure maple syrup brought in from New York. It looks really good, and I can’t wait to try it out on pancakes and waffles. Then, I also got 2 books written by Suzanne M. Malpass. She has written four books that are true stories about animals and have happy endings. Plus, they have wonderful illustrations. 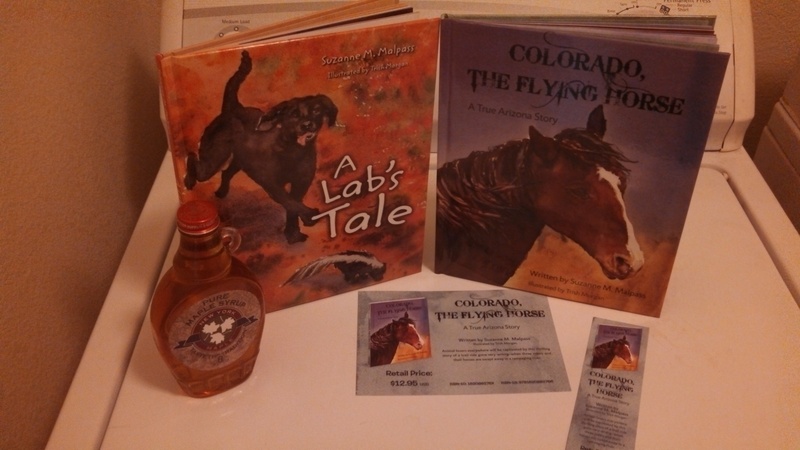 A Lab’s Tale is for us to keep, and Colorado, The Flying Horse is for my friend’s daughter who loves horses. Suzanne was there today and signed these books for me. To find out more about Suzanne and her books, you can visit Straddlebooks.com. She will be selling them at a festival in St. David, AZ, this weekend, and then is headed back north for the summer. You can also find her books online, but if you buy them in person, she will sign them as well, which is neat. My older daughter read A Lab’s Tale for her nightly reading log for school, and she really enjoyed the story. 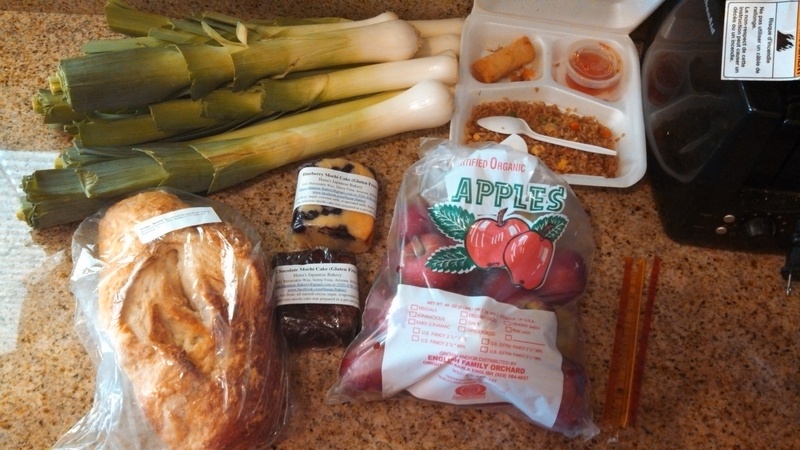 Hopefully, I will get to check out the Farmer’s Market more in the weeks to come, instead of going months in between! I haven’t been to the Farmer’s Market in WEEKS, but finally made it out there today. My 3-year-old was so happy, she loves to go and wander around. Plus, with her going to school now, she’s starting to get more social, so she interacts with people instead of hiding behind me. So happy about that! Mesquite Jumbles from Big Skye Bakers. Love these! Pumpkin from B.A.S.I.C. Farm. I know the owners, Christie and Clint Hardwick, from Bountiful Baskets, Christie runs the site on the opposite week of the site I help run, and I go out often to help volunteer at her site. I had previously gotten onions and tomatoes from her, which were very good, and my daughter picked a pumpkin today. 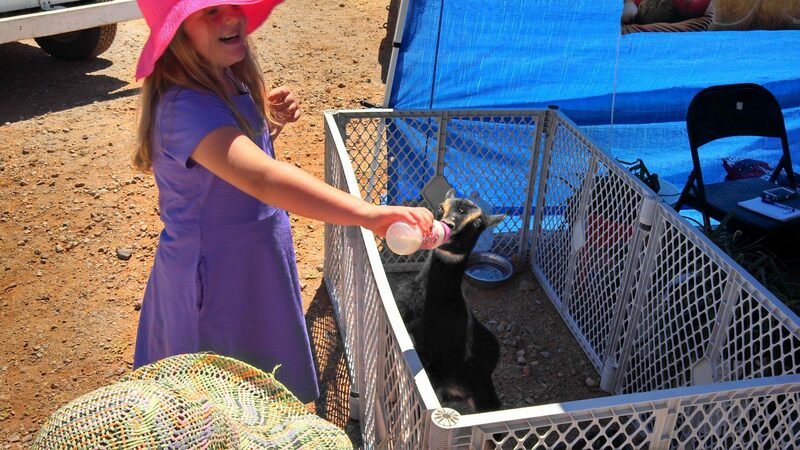 They have a variety of other produce, plus sometimes eggs and goat milk products. They grow organically. Chevre in olive oil and herbs from Tweenstone Farm. It says “Not” on the sticker because he has a hot and not hot version of this, and I got the not hot. It’s very good, and I’m deciding what to do with it, possibly Bacon Wrapped Chicken. Or, I will mix it with some chicken and pasta, making it like a creamy pasta sauce. After a few weeks of not making it to the Farmer’s Market, we finally found our way back this week! We got a mix of old favorites and tried some new things out too. Goat cheese, plain with light salt, from Canelo Dairy for $6.50. One of our favorites! I love it with any type of cracker. 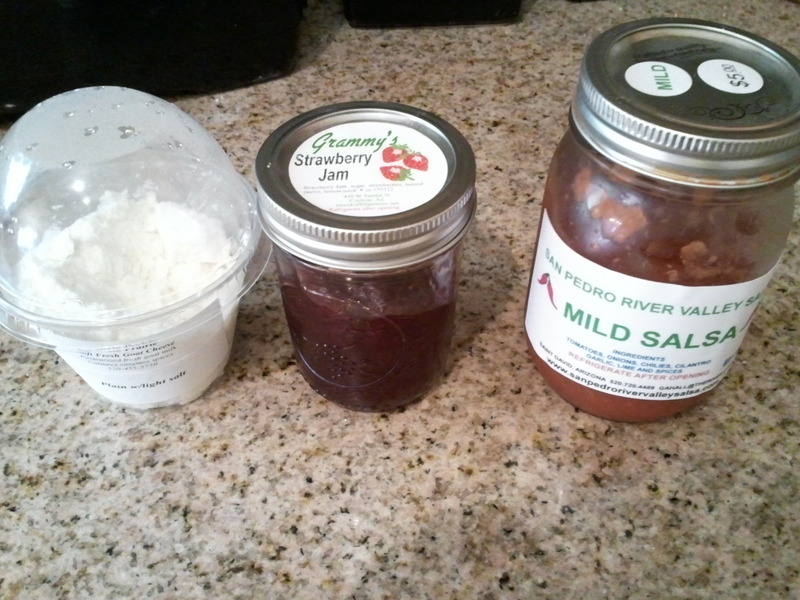 Grammy’s Strawberry Jam, $6. I know, I got a flat of strawberries from Bountiful Baskets, so I should make my own, but I haven’t gotten brave enough to do it. My husband is picky with his jam, so we decided to give this a try. It’s pretty good! San Pedro River Valley Salsa, $5. I have been wanting fresh salsa, and not wanting to wait for the Mexican themed veggie pack from Bountiful Baskets that I contributed for, I went ahead and bought some at this stand. First time trying it, and I am very pleased. It’s got just the amount of spiciness that I like, and tastes great. Exactly what I was looking for! Not pictured are honey sticks. The girls ate those before we got home! We’ll be visiting again next week. We’re hoping that Sky Island Ranch will be there with some steaks for us to grill for the 4th of July. YUM! I didn’t get a chance to go last week, but I my girls and I went to the Farmer’s Market this week. They love to go and pick up goodies for the week. And this week, we got a lot! 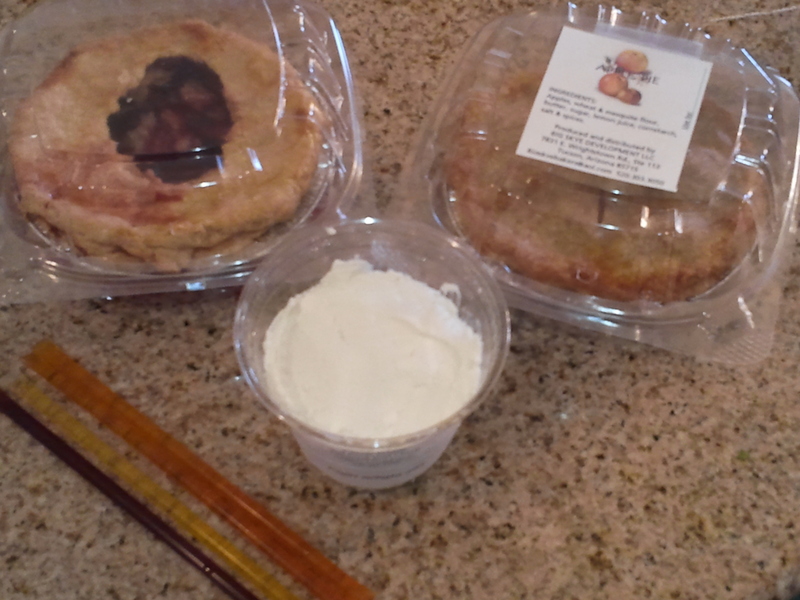 Mequite jumbles, a small cheery pie, and a gluten-free carrot cupcake from Big Skye Bakers for $13.50. The mesquite jumbles were really good, they put raisins, roasted almonds, dark chocolate chips, roasted pecans, and are made with wheat and mesquite flour. The cherry pie again was excellent. The carrot cupcake tasted a little different from what I’m used to, but I think that’s because it was made with rice flour, tapioca, and potato starch instead of wheat flour that I’m used to. It was still good, just different for me. Asiago Garlic bread and French bread from Gabe the Bread Man for $6 each. His bread was great last time I got it, and this bread is excellent was well. Plus, he’s cheerful and happy, I can tell he enjoys making the bread and selling it at the market to meet and speak with people. Plain with light salt goat cheese from Canelo Prairie Dairy for $6.50. My older daughter was begging for this again. Of course, last time she wouldn’t touch it, said it looked gross, then when she actually tried it, found out she really did like it. And, finished off what was left! It’s going pretty fast this time too. Honey sticks, 5 for $1. I’m not even sure what flavors we ended up with since the girls had trouble deciding which ones to get! Next week, I think we’re going to try out some tamales. I guess we’ll see when we get there! 1 cherry and 1 apple pie, both from Big Skye Bakers. My daughter was taste testing the cherry one on the way home, that’s why there is a chunk missing. These were $5 each. They bake using mesquite flour, and also have some gluten-free options. 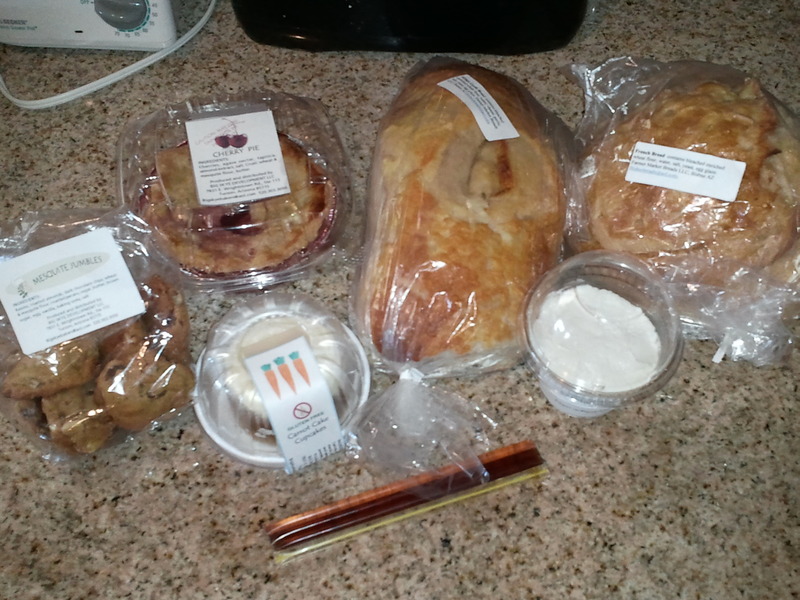 I may be stopping by there again next week, they had a variety of pies, gluten-free carrot cupcakes, goat cheese quiche, and mesquite jumble cookies that all looked delicious! The cup is Soft Fresh Goat Cheese, plain with light salt, from Canelo Prairie Dairy. It was $6.50. This is a yummy spread, tastes a lot like cream cheese, just made from goat’s milk. She offered a free sample before I made my purchase, which I gladly tried to make sure I would like it. I definitely did, and I’m sure this won’t last long! It’s amazing! And of course, the honey sticks, 5 for $1! This week my daughter picked root beer, green apple, and peach for the flavors. I tried a tortilla and a piece of the Spinach Feta bread, delicious. I’ve been trying out a new vendor each time, hoping to continue that next week. I’m thinking maybe some goat cheese or tamales next.